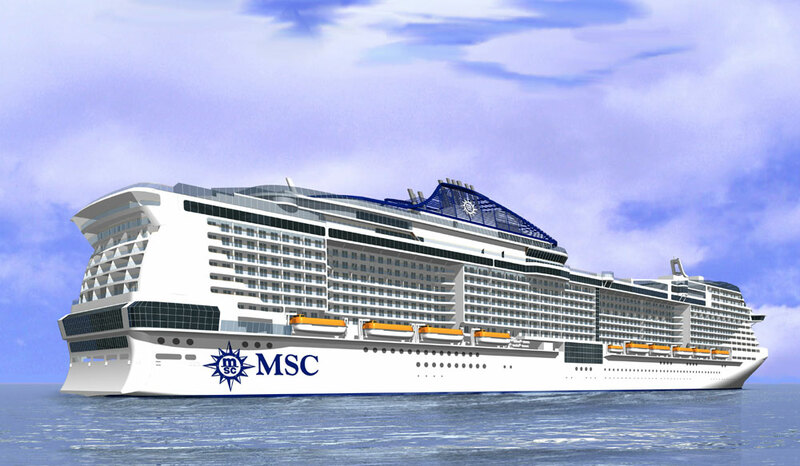 MSC Cruises has announced the order of two huge cruise ships with STX France. The announcement was made at the cruise lines coin ceremony for MSC Meraviglia which is under construction at the STX France shipyard in St. Nazaire, France. The two new ships to be built will be slightly larger than MSC Meraviglia and will be known as Meraviglia-Plus class at 177,100 gross tons. Both ships will carry 4,888 passengers at double occupancy and 2,444 staterooms. The first ship will be delivered to MSC Cruises in November 2019 and the second in April 2020. The Meraviglia Plus will be among the largest cruise ships in the world and will help expand the cruise lines expansion in North America, Europe and Asia. The MSC Meraviglia which is currently under construction is the first of four ships now ordered with STX France. The European based cruise line also has three Seaside class vessels ordered with italian ship builder Fincantieri. We can expect further announcements on the Meraviglia Plus class in the coming months including deployment and onboard features. MSC Meraviglia will be 167,600 gross tons and will be completed in June 2017. The ship will carry 4,500 passengers along with 1,540 crew members.